When the actor playing the Doctor changes, there are two ways to go on the overall tone of the show – Steady As She Goes or And Now For Something Completely Different. Over fifty years, the tone has changed with the Doctor six times, and stayed the same five. Now it’s changed seven times. 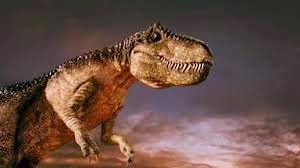 The opening shot of the Tyrannosaurus is, in the final analysis, probably there because Steven Moffat’s inner eight-year-old stamped his foot and said ‘Want more dinosaurs!’, and refused to write anything until the scene was agreed. Having it vomit out the Tardis is a pseudo-comic way of getting our heroes into the action and reuniting them with the Paternoster Gang. The explanations both for it being there and then (to use a Douglas Adams riff) suddenly not being there any more, are spurious and have more than a whiff of balderdash about them (yes, yes, taking things too seriously, only a TV show, yadda yadda yadda). The point is, none of this matters a jot. The opening of Deep Breath keeps you glued to the screen, waiting, just waiting, to see him. To hear what his first proper words will be, and see how he is, and who he is now. If Eccleston was the Survivor, Tennant the Chatterbox and Smith the Nutty Professor, from his first explosive “Shush” and his slam of the Tardis door, Capaldi gives us the Schoolmaster incarnation of the Doctor. The eccentric schoolmaster, to be sure, but nevertheless one in front of whom you wouldn’t want to admit not doing your homework. His first five minutes of gibber – everyone sounding English to his ears, and Clara, no longer the enigma wrapped in a mystery wrapped in a sweater that’s just slightly too tight but now “Thingy, The Asking-Questions One – is largely that: post-regenerative gibber to launch the Doctor with a comic vibe, as seen in Tom Baker’s first story and David Tennant’s, though it does indicate a more alien, spikier presence in the Tardis. He winds himself into a frenzy, collapses – annnnnd cue credits. And what credits. Anyone else think that if you strapped Steven Moffat down and sawed the top of his head off, those credits are what you’d find going round his brain? Fabulous, dark, immensely complicated and very…erm…timey-wimey. And then, for reasons which undoubtedly make sense inside that skull, set to a mid-80s retro version of the theme. Well alright, maybe that’s not exactly new – Jon Pertwee, Peter Davison, Sylvester McCoy, Paul McGann and David Tennant all spent at least part of their first story asleep, recuperating. With Capaldi, that makes six of the twelve. But the speed with which the new Doctor is up on his feet and Being Weird is a shot in the arm compared to Tennant’s largely recumbent first episode. Capaldi channels a little McCoy, but much more Pertwee, in refusing the door on the grounds that it’s boring (anyone else fall in love with the Twelfth Doctor on this line? ), climbing out of the window and liberating a horse on which to make his dashing escape. Pertwee’s wheelchair chase is gleefully updated, and the new Doctor is clearly not averse to a bit of action heroism. Can we put the ‘old man’ schtick to bed now please, it’s tired and needs a rest. Of course, the technical villains of the piece here are the Clockwork Droids – a sister crew to the Madame Du Pompadour’s masked monsters. 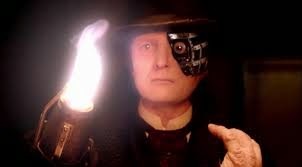 It’s a reasonable certainty that no-one ever wrote to the production team begging ‘Please, please, please bring back the Clockwork Droids,’ because there’s something inherently and fundamentally naff about their villainy. But what they are, both times, are excellent carriers, both of real-world satire and of character development for the Tardis crew. In The Girl in the Fireplace, they were essentially a satire on rigid bureaucracy – they have an idea, and they stick to it, and people get killed when they get in the way, because the idea cannot be wrong. Here, they’re a properly Doctor Who stab at organised religion and dogmatic belief – their quest for the Promised Land being the reason that presumably, over time, millions of people have died (the skin balloon is a particularly nasty, Philip Hinchcliffe idea, no?). Here though they do get a deepening – there’s something so pathetic, in the true sense of the word, about their mission, their belief, their desperate goal, that they do make us feel sorry for them (and indeed, for their real world analogues who believe in killing people to get to Heaven), while still abhorring what they do in pursuit of that goal. And as a vehicle for character development, they can’t be beaten. 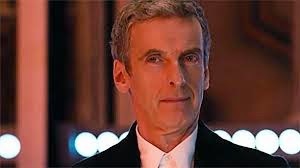 Whenever Capaldi is on screen here, if you’re looking anywhere else, you’re missing the point. 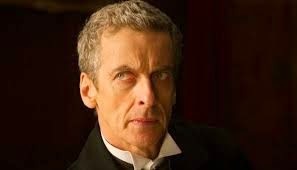 He plays the post-regenerative journey straighter than anyone since Tom Baker – he’s a bit barmy and unpredictable up to the scene with the tramp, exploring the physics and philosophy of regeneration, and seeding the idea of the importance of his previous appearances in Who and Torchwood – “Do you know this face? I think I do…” while in the same scene, delivering one of the episode’s signature comic monologues, tackling his Scottishness – “I’m Scottish? Ahhhh, good, I can complain about things” – his age, and those eyebrows – “those are attack eyebrows!” We also see the Twelfth Doctor’s determination to get his way – “Give me your coat!” – though we later learn he’s exchanged the Eleventh Doctor’s watch for the tramp’s clothes, which suggests he’s not about to enforce his way, so much as bargain for it with everything he’s got – including a death stare from those attack eyebrows. 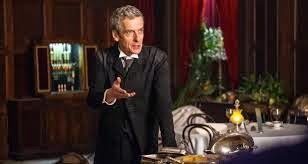 Once he and Clara meet back up, Capaldi’s Doctor is essentially fully formed, but the scene in the restaurant shows how the two work together – more gibber and bicker than Clara had with the Eleventh Doctor - and is then brilliantly undercut by the following scene, when in a shocking move, and with a selfish rationalisation that feels alien and new, he leaves Clara in the clutches of the Droids and skips out, only to rescue her minutes later in a gruesome disguise and with a momentary homage to Eccleston’s first appearance. He leaves Clara alone with Half-Face Man, in clear and present danger, till she gets the Droids’ plan from him – one of five standout scenes for Clara in the episode, each one of which adds a piece of her personality, overlaying the Clara we know (heavy on the feisty, light on the believability) with a young woman whose world, whose every certainty about the man she followed through time and space has been shattered, blown to pieces. In particular, her heart-to-heart with Jenny about love and change and how to accept it, and her spitfire contest with Vastra over the value of a face and an appealing physicality bring the grown-up out in Clara, so when she’s alone with Half-Face Man, although she’s terrified, she’s able to bring her classroom history to bear and face him down. Arguably, there’s a degree of the Doctor testing her here, in McCoy and Ace style, to see whether she’s still any good to him in his new incarnation. The end of the story has the schoolyard game element common to many Moffat stories – notsomuch don’t blink as don’t breathe – determining the survival of the Paternoster Gang and Clara, while the Doctor does his new and particular thing. Capaldi’s self-statement scene is positively breathtaking in its intensity, offering the villain a drink before having to kill him. The war of words over the Promised Land, is comic to a degree, but also desperate, a Doctor almost begging to be saved from the thing he knows he’ll have to do. The grunting physical confrontation is another departure from the Smith incarnation, and feels more visceral even than Tennant’s sword-fight for the planet. Capaldi’s snarled dedication to the people of earth too is more angry and proud than Smith’s chat to the Atraxi, and less grandstanding than Tennant’s “It Is Defended!” – it has the air of a Glasgow pub on a Friday night, a kind of “Oh aye, is that right, pal? How you gonna reach the Promised Land with no teeth?” certainty – I will kill you if you make me. The possible double-cross leading to Half-Face Man’s plummet to earth feels shocking, but shouldn’t – Rule 1, remember: The Doctor lies. And that look – the look from the trailer: a haunted man flicks up his eyes, and who knows what those eyes have seen or known? That’s who this Doctor is. The Schoolmaster with secrets in his soul. He’s a man we like, a hero we love, but we wonder, in that look, if he’s still all there. Annnnnd then, just at the peak of its perfection, the production team loses faith that they’ve done their job and sold us the new Doctor, crowbarring in a call from the last incarnation, because without it, Clara, for all her fine words, can’t find it in herself to see the Doctor beyond his body. It’s a peculiar reaction, particularly for Clara, parts of whom have seen the Doctor as an old man, as a short man, as at least a podgy man, if not a portly one. And it weakens the storytelling unnecessarily. Yes, some fans will punch the air at the call, but a year from now, ten years from now, it will look like a moment of weakness and insecurity. Though it’s worth noting the importance of “I never said it was your mistake.” The line shows us what the Eleventh Doctor was doing with Clara in those “Ding dong!” and “I shall glance at a manual” moments – he was fooling himself. He was letting himself think he was young again, because he had a young-looking body. He has an older body now, and he’s not fooling himself any more. He’s not Clara’s boyfriend. The Fairy Tale era is dead. But with Clara’s faith in the Doctor at least partly restored by the phone call, and a unilateral hug administered, off they go, the Schoolmaster Doctor and his schoolteacher companion, to find out more about each other and their new relationship. Except of course it isn’t. There’s a bolted-on Moffat story-arc. There’s the Gatekeeper of the Nethersphere swanning about in ‘The Promised Land,’ talking about her ‘boyfriend’ defeating the Clockwork Droids. Oddly, this arc, which was clearly intended to make us all go nuts with speculation, feels less effective than practically anything in the story to which it’s attached. We wonder briefly about River Song of course, but suspect there’s something new and tortuously Moffat-flavoured waiting for us over the course of the next twelve weeks. Deep Breath, taken as a whole, delivered a re-trodden enemy, and an agreeable satire on religious immobility of thought. It delivered a dose of pathos at the mental exhaustion and dullness such thinking breeds. But let’s not kid ourself this one was every about the plot. Because more, much more than this, it handed Capaldi and Coleman a blazing two-hander, that has raised issues and stamped the personality of the new Doctor all over Saturday nights again. He is different, and the tone of the show is different too – more grown-up, more hard-eyed and punchy. Take a deep breath, everybody – we’re heading into darkness. what an odd review. I can't tell if you love the story or despise it. Lovely review, thanks for taking the time. I love it Jack. Apologies if that doesn't come across. Thanks for your articulate and thoughtful review: I look forward to more over the coming weeks. An overall good start for the 13th incarnation, though the first 10 minutes or so could've been written a lot better. It really could've done without the T-Rex. 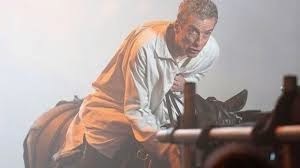 And -- oh god -- the Doctor translating the T-Rex. That was Jurassic-Park-3 stupid.